Saes Smart Materials is among the largest melters of Nitinol, but also the most highly specialized when it comes to test melts of experimental alloys (binary, ternary, quaternary and beyond) where multiple elements are added (Co, Cr, Cu, Fe, Pt etc.). Such alloys are routinely tailored for specific thermo-mechanical responses. Other material properties such as radiopacity can be targeted. Following is an overview of Memry´s Nitinol alloy specifications. Customized alloys can be created in collaboration with customers. Please contact us to discuss the alloy your next project requires. Starting with virgin raw materials, Saes Smart Materials melts and converts all forms of Nitinol into hot worked mill product such as round billet, rectangular slab, bars, coil, plate and rings. Saes Smart Materials also offers cold drawn semi-finished redraw wire. We also melt superalloys, encompassing a broad chemistry population which includes (but is not limited to) pure Co, Fe, Al, modified 718 (NiCr alloy), Fe-based alloys, Ni7V, FeNi, 702 (Ni-Cr alloy), CoNi, UMCO 50 (Co-based) and Vicalloy. Our superalloys generally involve relatively small heats (30 to 2000 lbs) of standard and custom chemistries. All standard binary Nitinol formulations are produced in these forms, along with specialized ternary and quarternary alloys. Customized alloys can be created in collaboration with customers. Please contact us to discuss the alloy your next project requires. 80 Percent: That’s how many fewer oxides are found in Redox™ Nitinol alloy. With reduced oxide area and particle size, Redox offers enhanced microcleanliness and enhanced confidence. The presence of non-metallic inclusions and porosity is how the industry measures Nitinol microcleanliness. Typical non-metallic inclusions are carbides (TiC), and intermetallic oxides (Ti4Ni2Ox). The size and distribution of these inclusions play a critical role for device designers who work with Nitinol. In response to our customers’ challenges, Memry developed Redox. 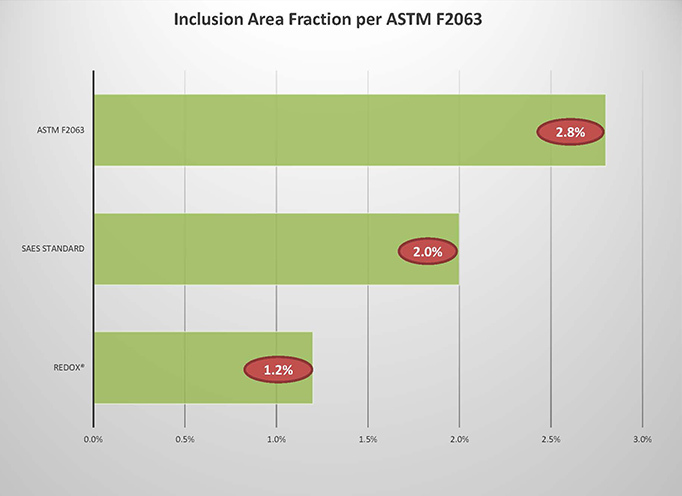 As the charts make clear, Redox offers significant improvements over SAES and ASTM F2063 Standards for maximum inclusion area and size. 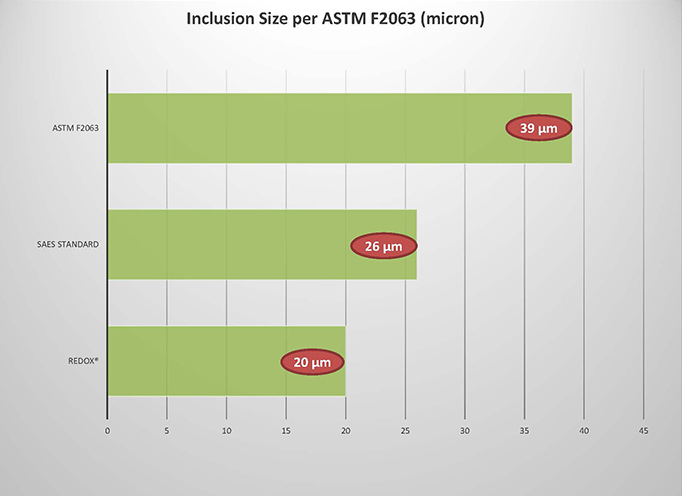 This is an important consideration for medical and industrial high fatigue applications, but also for miniaturized products where inclusion size must be contained due to extremely fine structures. Redox is available in all mill product, semi-finished and component forms. The Redox process closely mimics standard Nitinol melting and conversion processes, meaning consistency in supply and availability in large quantities. 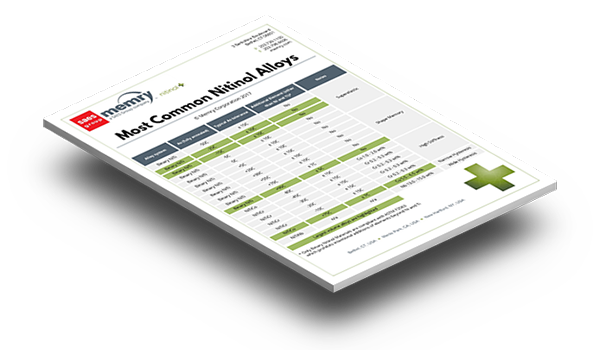 Download our Inclusion Analysis PDF or our Most Common Nitinol Alloys Chart PDF below.